My wife and I are heading off to Europe this year, specifically to Italy and Germany. It’s quite an undertaking to plan such a trip. I’ve talked to quite a few seasoned travelers to garner their wisdom about flights, hotels, car rentals, places to see, and to borrow Frommers travel guide books, etc. But to be honest, without access to the Internet, I’m not sure how we would plan a trip like this. We wouldn’t be able to do it without a travel agent/expert. Note that the castle in this picture is located in Neuschwanstein, Germany and influenced the design of Sleeping Beauty’s castle in Disneyland, cool hey. After a short stop in Munich, we will drive to this small German town, near the Austrian border, and begin our Romantic Road journey through various medieval towns. When my wife and I planned our honeymoon over 26 years ago (yes, I’m getting old), I recall us consulting with a BCAA travel agent. They helped us figure out which cities to stop in and hotels to book, along the way to Disneyland. We even received printed driving route maps (remember this was before GPS, Google/Bing maps, and smart phones). They helped us buy tickets for various activities, etc. It’s hard to believe we planned the trip and drove all that way with no access to technology to assist us, not even a cell phone. To plan our Europe trip, we “googled” for ideas and relied on free information from other travelers in addition to online trip guides from companies like Frommers, Fodors, and Rick Steeves. Google Translate is a very useful tool for websites that don’t have an English language option (many don’t) so that I could read them. For accurate pricing, most sites had currency translators and there also universal currency translator apps and websites. I purchased an Italian and German “top 100 phrases” apps for my phone to help us when we’re there. I created a personal Google map of the Germany leg to help with planning the driving trip. As I researched towns, I added them to the map. Later I used the map to calculate driving routes with distances and travel times. From the map you can then access pictures, points-of-interest, and lots of details for each city and route. Now imagine for a moment future possibilities for travel planning. In particular I believe that 3D immersive planning environments will be common place. A future trip planning exercise will involve virtual travel in advance to be able to “experience” the sites and activities in advance of a visit. We could do a walk-through of our accommodation, speak to the operators, visit key sites, hear the sounds. Perhaps as we virtually travel, an itinerary will be produced for us, virtual agents can be instructed to book flights, accommodations, tours, and all the details will be saved and available on our personal travel website, our smartphones, and our tablets. I can see huge potential for innovation in the travel planning industry. It’s certainly come a long ways since my honeymoon trip to Disneyland but it could be so much more by 2020. If anyone has any travel advice they’d like to share or specific suggestions for us related to our upcoming Europe trip, please do leave a comment. Every so often I just have to pause to contemplate the awesomeness of our world. Technology has certainly brought the world amazing tools and services. I’m reading an historical fiction book “The Seekers”, book #3 in an 8 book series. The story is set in the late 1700’s, early 1800’s in the newly formed USA. At one point a young couple migrates west down the Ohio river, acquires 20 acres, builds a crude cabin, begins to clear land, plant corn, and own a cow. The harsh lifestyle is astonishing. I suspect that most of us in the developed world take for granted what we have and enjoy. Those early settlers lived on corn mush and semi-sour milk, every day, every meal. Their cooking, bathing, clothing, labouring, entertaining capacity was very poor. To reach the small village near the fort to trade with others, they walked four miles through harsh terrain. At least they had ‘central heating’ for their cabin, a fireplace! Think about the impact of central heating and electricity on our lives. On page 433 one character proclaims “the pace of invention and technical progress is astounding”. It’s amazing how we’ve lived and experienced that statement over the past 200 years. Invention and innovation are self fulfilling phenomenon. One feeds the other. This is our history. Think about the “simple” wheel . 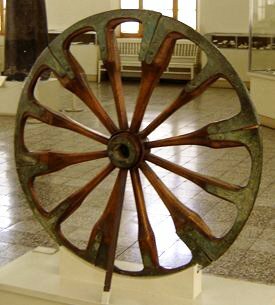 The wheel “has become one of the world's most famous, and most useful technologies” (ref). How many innovations and new inventions were spawned by it’s development? This is the story of all invention. One creation leads to another, which leads to another, and so on. The so called ‘information age’ has been a breath-taking ride of amazing invention! Riding the wave of innovation has given us smart phones, tablets, and the wireless Internet. Think back 15 years… do you recall ever imagining being able to take a picture with your phone and within seconds have it appear in a blog post that will be accessible to billions world-wide (okay, my readership isn’t that broad). I used my Windows 7 Phone to take a picture of my laptop screen chose to email it to myself. Seconds later the email arrives on my laptop, I open it, save the attached picture to the laptop and drag it into this post. Take a moment to consider the amazing complexity of what just occurred to make this happen… you can’t comprehend it can you? None of us can even begin to “really” explain the layers of technology involved and how they work. Oh wait, you probably never imagined blogs. Isn’t it amazing that anyone can now become a writer on the world stage and at very little cost (some widely available tools). If you have the benefit of owning an iPad or other tablet you should be amazed every day! I’m listening to Christmas music, streaming wirelessly of course, through my iPad using a free app, AccuRadio. I can access something like 480 different music “channels” through this app. Does anyone remember when radios were varying sized boxes of electronics with an antennae that allowed access to a few dozen nearby stations? Okay, we still have this in our home stereos and cars, but it won’t be long before everything is simply an App that gets its life from an Internet connection. As we enter 2012, we should be prepared to be even more amazed. I’ve written many times that we are on the steep side of the exponential curve of change and innovation. Predicting the next year let alone 10 years is becoming nearly impossible. Amazing inventions are being produced faster than ever. We should take time to ponder where we’ve come from as we ride this wave of change. Here’s looking forward to a great 2012. I wonder what new inventions we will get to experience… Take time to Be Amazed! People have optimal learning paths involving diverse means and difference paces. Taking that to heart should drive us to personalize learning for adults and students wherever possible. For years, society has accepted the efficient path of teach to the middle, keep to the schedule / pace, etc. Not only in K12 classrooms but most places training or learning is offered. In adopting technology, I’ve learned that we must differentiate the learning of the tool, in a real context, and at a pace suited to each individual. “our education system is based on a model of learning from an earlier century. To change that, we need to put students at the centre of their own education. We need to make a better link between what kids learn at school and what they experience and learn in their everyday lives. We need to create new learning environments for students that allow them to discover, embrace, and fulfill their passions. We need to set the stage for parents, teachers, administrators and other partners to prepare our children for success not only in today’s world, but in a world that few of us can yet imagine”, Minister of Education George Abbott. The plan includes goal #5 Learning Empowered by Technology and “will encourage smart use of technology in schools, better preparing students to thrive in an increasingly digital world. Students will have more opportunity to develop the competencies needed to use current and emerging technologies effectively, both in school and in life. Educators will be given the supports needed to use technology to empower the learning process, and to connect with each other, parents, and communities”. This sounds all progressive and future-oriented but how do we achieve this with budgets fragmented by competing priorities and educator readiness all over the map? Difficult maybe, but as I expressed my thoughts in Technology is Why Education Must Change, it would be inappropriate for us to avoid this hard work. I was having a deep conversation with a wise colleague of mine recently which carried on into e-mail with some sharing of blog posts related to adoption of technology in schools. My last blog post included “too often new technology is placed in classrooms and it is used to do old things in new ways”. My colleague is concerned that this is too high an expectation for people and that it can be impossible for them to learn a new tool and try to do something new with it. I agree that old with new can be a valid entry point for people but I think it needs to move past this. Technology is “just a tool”, if nothing about one’s practice changes. It’s when people are able to do new things not possible without the tool, that the true amplification and transformative power of technology is realized. We continued our conversation via e-mail. My colleague made some thoughtful comments with “it’s the dismissive and absolute statements that stop people from engaging” and “it’s developmental and people need to recognize this as a first stop and not evaluate and discourage… degrading entry level adoption” and further, “educators feel defeated when what they are trying to do isn’t good enough”. This carried on with a concern that “there is a thread through much of the technology in education conversation by the ‘elite’ that completely dismisses the first step of learning anything is to combine what you are learning with something you know how to do”. I know, this is complicated, can be expensive, and time consuming. On ever squeezed education budgets, how is it possible to be successful? The obvious answer is to “adjust priorities”. But as you know, there are often significant trade-offs that are difficult to accept or budgets that are inflexible due to “the rules”. I agree also that is about a cultural shift and structures need to change as Dave Truss wrote in Thinking about Change “I think to change the culture, we need to first change the structure. We have to stop counting a teacher’s ‘instructional minutes’ and start giving them ‘learning minutes’. We have to stop talking about ‘teaming’ and starting giving teachers time to be a team”. But if we are to meet the challenge of Goal #5 in the BC plan, we need to figure out how to do this successfully. I hope you believe as I do that it is imperative to our future. I would love to hear from others their views on how to best meet the technology adoption challenge. I’ve just finished reading Where Good Ideas Come From: The Natural History of Innovation by Steven Johnson. Johnson provides some pretty interesting arguments for the ideal contexts where innovation flourishes. I struggled with his reliance on evolution theory as fact but his more reasoned thinking is very good. Our amazing, and it is amazing, technological wonders are a direct result of hundreds of years of innovation. But, I started reading Technopoly: The Surrender of Culture to Technology by Neil Postman at the same time. Technopoloy has certainly influenced the writing of this blog post. Being a passionate advocate for adopting technology in schools, business, and life, I often feel torn by the fact that “[e]very technology is both a burden and a blessing; not either-or, but this-and-that” (Technopoly, Kindle 95). I think that most of us believe that “technology is a friend. It makes life easier, cleaner, and longer” (Kindle 59). History certainly bears this out. Our lifestyles reflect this, even the poor among us (in our society) live far more “comfortable” lives than the poor of 200 years ago. Think about modern homes, central heating, plumbing, stoves, refrigerators, freezers, cars, etc. – technology has done wonders to improve our lives. But at what cost will future technologies impact our lives? My work context is as a technology leader in a large school district. We often read that “technology is just a tool” in classrooms. I beg to differ, technology will increasingly define learning and teaching, and we haven’t really seen what’s possible yet… Nearer term, our District is contemplating the effective implementation of tablet (initially iPads) devices to support learning. Certainly what we read in blogs and news articles these days about iPads in schools, we get the impression that “the idea of newness is closely linked with that of improvement. Nowhere does he see any limit placed by nature to human endeavor; in his eyes something that does not exist is just something that has not been tried” (Kindle 788). Having used an iPad for the past 18 months, I do think the iPad is an invaluable tool for learning. As we pilot these in our schools it will be critical to ensure that teachers and students are using them to do new things in new ways. Too often new technology is placed in classrooms and it is used to do old things in new ways. IE, a worksheet on an iPad is still a worksheet, it’s just using a cool touch interface. We need to be sure to take advantage of the new ways to learn in ways not previously possible. I was recently in a grade two classroom where the teacher and students were using a SMART board to learn about money. The board was used very effectively to involve the kids in counting and manipulating money, buying and selling, and explaining their thinking processes, etc. She also had them buying and selling physical stuff in the classroom with coins while two students documented (iPod Touch video, digital camera) the exchanges between student buyers and sellers. It was a brilliant use of physical objects and digital tools to support and document learning. Postman talks about how technology begat the rise of Information: “[f]ifty years after the press was invented, more than eight million books had been printed, almost all of them filled with information that had previously been unavailable to the average person” (Kindle 909). He then suggests that “[t]here were several reasons for the rapid growth of the common school, but none was more obvious than that it was a necessary response to the anxieties and confusion aroused by information on the loose” (925). Fast forward to our day and “[i]nformation has become a form of garbage, not only incapable of answering the most fundamental human questions but barely useful in providing coherent direction to the solution of even mundane problems” (1030). Apparently, “Goethe was the last person who knew everything… by the year of his death, 1832, it was no longer possible for even the most brilliant mind to comprehend, let alone integrate, what was known” (1299). Perhaps we crossed a line just under 200 years ago where what was knowable, now exceeds human capacity. We forever became dependent on our technologies to survive the coming information glut. Since Technopoly was written in 1993, it was before current tools existed for aggregating and managing data and information. The early Internet search engines for example were terrible at providing “answers”. Now with modern techniques, it is amazing how quickly we are able to make sense of the vast ocean of information available to us. Think about how beholden you are to your technology. You probably have a cell phone, likely a smart phone. If you don’t have an iPad or some other tablet, you probably will, soon. In your home are likely numerous TV’s, a PVR, gaming machines, several laptops, maybe a desktop computer, and certainly an Internet connection with wireless connectivity. Could you live without this stuff? Seriously? I doubt you would give any of it up. Technology does have the tendency to seduce us into wanting more, new, better, faster, smaller, cooler tools. We’re excited by what we have, until the next new thing is announced! Where will this exponential growth of technology lead us to? For those of us involved in leading change in schools, how do we thoughtfully embrace technology while avoiding the seductive effects? Do any of you feel like we’re in times of extreme change? If you don’t, you must be living in an alternate reality! I talk often about how change is exponential. When we look back hundreds of years or even 30-40 years, things didn’t feel like they were changing all that quickly. But now, when we reflect back just a single year we can marvel at what has changed, in particular how technology has changed how we do things, enjoy things, play, interact, work, and learn. Notice the green (exponential) line in the graph. The leading edge is history past where change was almost unnoticeable in one’s lifetime while we are now likely at the sharp up-turn point of change. “[a]s a teacher in this district, I worry about the time and resources we commit to the pursuit and path of technology… there does not seem to be enough attention paid to the counterclaims and the alternative narratives, which can be quite persuasive. The plethora of knowledge issues that have emerged from the claim that technology brings significant benefits to education should be cause for hesitation and a sober second – and third – look. With this in mind, and as people struggle economically around the world, to spend so much in one place and for one vision is perhaps unwise”. “there are nominal PD plans for support, huge redirection of resources … I'm not opposed to technology- I'm opposed to its use and abuse in the name of ‘progress’ … There are good things - in places - but at what cost to the system overall and with what type of long range plan”. I do agree with planning and preparing but the windows for doing this are becoming narrower. With things changing so quickly is the concept of “long range plan” still practical and relevant? When we read statements like “Siri is a game changer for education” on twitter or in blog posts, leaders are expected to plan for this? Really? What about iPad 2 with front/back facing cameras? We can’t forget Apple TV and the experience of an unwired iPad filled classroom. Seriously, these are potential game changes but how do we anticipate these, build professional development plans, and implement systematically? Organizations used to create carefully thought-out long range strategic plans. With the pace of change we’re seeing now, the best we can do now it seems is to have a concept of the future and then figure it out along the way, adjusting course as needed. I wonder if we’re at a stage where some forms of technology just don’t need a lot of thought or planning to be adoptable and valuable? Isn’t it better to open windows, provide opportunities and let people experiment, learn, and share? Maybe we plan for and lead perpetual experimentation? Neil Postam in Technopoly says “when we admit a new technology to the culture, we must do so with our eyes wide open” (Kindle 138). I think increasingly new technology is adopted quickly and without much thought (is this ‘bad’?). When’s the last time you put much thought into upgrading your phone when your plan ran out? You probably just got the latest iPhone, Blackberry, Windows, or Android phone. I bet your “old” phone still worked fine, didn’t it? But, you wanted the new one… Daniel J. Boorstin said “education is learning what you didn't even know you didn't know”. I extrapolate this to “technology opens up new possibilities to do what you didn’t even know you needed”. “A new technology does not add or subtract something. It changes everything” (Technopoly, Kindle 295). Think about how the pressure is building to completely disrupt school as we know it. Neil Postman shares that “school was an invention of the printing press and must stand or fall on the issue of how much importance the printed word has. For four hundred years, schoolteachers have been part of the knowledge monopoly created by printing, and they are now witnessing the breakup of that monopoly” (Technopoly, Kindle 171). What technologies and institutions come to mind when you consider that “when an old technology is assaulted by a new one, institutions are threatened. When institutions are threatened, a culture finds itself in crisis” (Technopoly, Kindle 300)? Textbooks will very quickly disappear into multimedia immersive experiences located on student e-book readers (apps on very powerful tablets). So much of our lives seem to be at risk of disruption by technological change these days. “New technologies alter the structure of our interests: the things we think about. They alter the character of our symbols: the things we think with. And they alter the nature of community: the arena in which thoughts develop” (Technopoly, Kindle 319). Isn’t this a good thing for education? Isn’t this the role of education? How do we lead in such uncertain times? "All professionals need networks to engage in problem-solving conversations at the edge of their expertise - we learn at the edges", Harold Jarche. Leaders more now than ever before need to be connecting with each other and with the people they lead. People need assurances that everything will be okay. Dalai Lama says "developing inner values is much like physical exercise. The more we train our abilities, the stronger they become”. Leaders need to be doing this, constantly. Leaders need more now than ever to be tuned into current realities and future possibilities. Leaders need to be connected and networked. Leaders need to be able to make sense of what is going on and what may come and communicate it clearly and often. Leaders need to be able to interpret change and reassure those they lead that there is a way forward and through each wave of change and what the change will mean to them. Leaders need the “capacity to see the most creative and improbable opportunities” (Building the Bridge As you Walk on It: A Guide for Leading Change, p. 127). Leaders need to be futurists! What advice would you give to leaders in these times of extreme change?